Corporate Facility Partners Green Buildings (CFP Green Buildings) has set out to make existing offices and organisations sustainable. CFP Green Buildings believes that the CO2 emission of companies can be reduced by 50% in 2050 through 25% green energy and 25% energy savings. This sustainability ambition makes them a perfect match for the Nudge Global Impact Challenge. Therefore, Nudge is very proud to announce that CFP Green Buildings has joined the 2017 Challenge as a Support Partner! As the 2017 Challenge is themed ‘GDP or SDG? Nudging young leaders towards sustainable economics’, CFP Green Buildings is very motivated to have two talented young professionals participating in the Challenge. These young future leaders will work hard on their impact plans in order to accelerate CFP towards their green ambition. 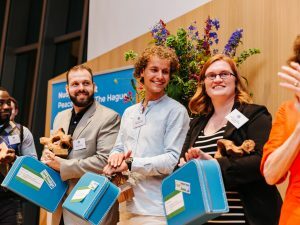 During the Challenge all participants will be inspired and equipped with the knowledge, skills and a unique international network necessary to achieve their sustainability ideas. CFP Green Building’s activities span over seven countries with more than 100,000 workplaces. 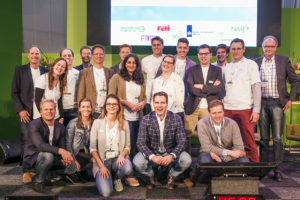 With their knowledge and expertise in making offices and organisations sustainable, they count major companies such as ABN AMRO, ING Bank, VIVAT, NUON, Strukton, and CGI amongst their clients. This fits right into the global sustainability character of the Challenge. The complete staff of CFP Green Buildings.